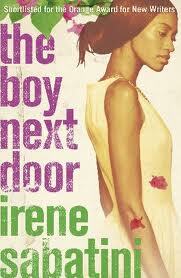 The Boy Next Door, Irene Sabatini's debut novel, is a love story set in Zimbabwe. It's divided into 4 parts, starting in the early 1980s and ending in the late 1990s. Part One (1980s) - The boy next door, seventeen year old Ian Mckenzie, has been arrested for setting his stepmother on fire. It is here we meet fourteen year old Lindiwe Bishop. In the midst of a country transforming (from Rhodesia to Zimbabwe), Lindiwe is fascinated by the (white) boy next door. Lindiwe herself is 'coloured' (mixed race) - her mother black and father colored. In between her fascination with Ian, we read about her family life (her parents loveless marriage, her war vet uncle) and her school life (her experience of being one of the few 'coloreds' in an all-white school, the one friend she makes in the school, Brigette) in Bulawayo, the second city in Zimbabwe. Less than two years after the book begins, the charges are dropped, Ian is released and an unlikely friendship develops between Lindiwe and Ian. At this point in the book I wasn't quite sure how I felt about the characters. Ian said what he wanted and how he felt while Lindiwe was shy, sensitive, and introverted. Part Two (Early 1990s) - We meet Lindiwe again, 5 or 6 or 7 years later, she's now in university and Ian is a photojournalist working in South Africa. They kept in touch over the years and meet again in Harare. Despite the length of time apart, those feelings are still there. Ian is also still the same - he says what he wants and how he feels and Lindiwe, while slightly more outspoken than her younger self, is still very much introverted and still in awe of Ian. It is in this part, we discover a secret that Lindiwe has been keeping for years, but one I am not going to spill as it changes the tone of the book, as well as Lindiwe and Ian's relationship. Part Three (Mid1990s) and Part Four (Late 1990s) is where I really began to start enjoying the book. Ian and Lindiwe are now sort of together (although they never refer each other as being each other's partners) and other secrets are revealed. In between their love story, Irene Sabatini also keeps us in the loop of the changes Zimbabwe has experienced during this time - the politics, the changing economy, the military, the racial violence, and what it's like to be 'colored'. It is hard to write about the second half of the book without giving too much away but in this part we not only see Zimbabwe changing, but also Lindiwe and Ian, both individually and as a couple. I love the way Irene Sabatini writes about Bulawayo, Zimbabwe's second city. I have never been to Zimbabwe, and if I'm honest until I read this book I only really knew about Harare. Her depiction of Bulawayo gave me an insight into what it must have been like in the years the book was set. I also love how some Zimbawean (or maybe Southern African) phrases are interjected into the book without any need for translation, such as lekker (which I believe might mean cool) and lightie (which I believe means young/young person). The one thing that simultaneously frustrated and made me smile was Ian and Lindiwe's relationship. I wasn't too sure about Lindiwe or Ian initially - I liked them, I didn't like them; I liked Lindiwe, I didn't like Ian; and then I liked Ian but I didn't like Lindiwe. As I read, and the characters began to develop and I got to know them more, I realised that these are just two people, with differing points of views in a racially divided society, trying to have a relationship. They are flawed, but who isn't; and their relationship isn't perfect, but whose is. Yet, they manage to be together in their racially divided, politically charged world. My review is a bit longer than usual, but that's because the book is quite long and covers a lot. Despite its length (it's about 400 pages) and the different issues it covers, it is so simple in its complexity. It was also surprisingly quick to read. It took me a while, but I grew to love this book and would definitely recommend it. Thanks for the recommendation, sounds like a great read.